... that May is bound to keep." A very true quote here in Michigan. But I say, Hurray for April! Spring finally comes in April. Can't wait to see my daffodils again. My husband and my dad have April birthdays. Better get going on those masculine birthday cards. Easter Celebrations. So much to be thankful for. So much to look forward to. Yes, April is looking pretty wonderful. I have three items for you on this first day of April. No fooling. Item #1 (with three subheadings) The three design teams I am privileged to be associated with reveal their monthly challenges today. 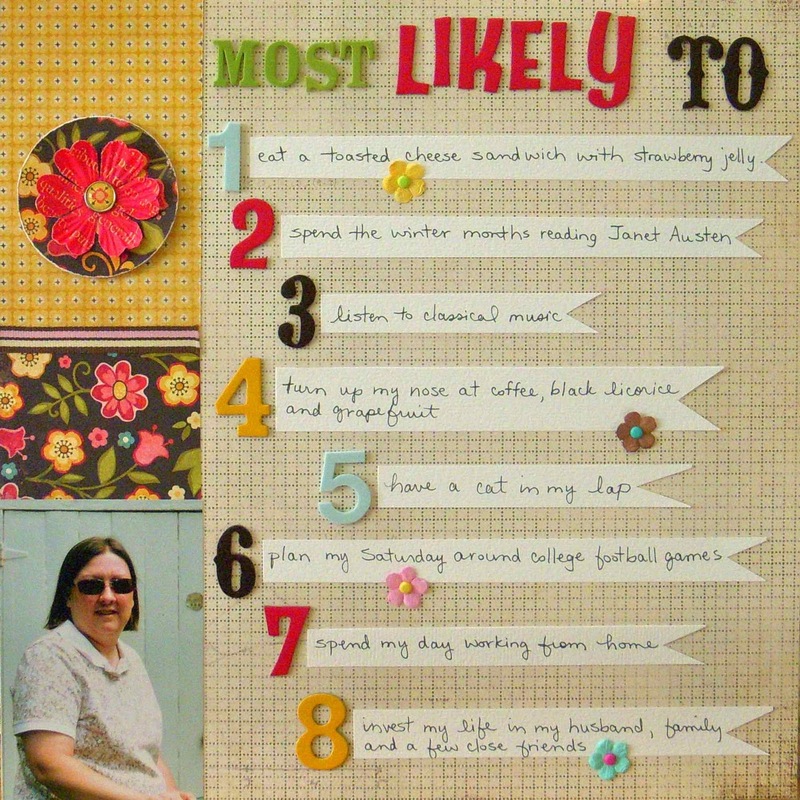 Journaling Junkie: Challenge #101 is to create a layout with the title Most Likely To. Such a great idea! I scraplifted the design for my layout from a page by Stephanie Baxter that appeared in a recent issue of Scrapbook Trends Magazine. When I make a layout like this, I like to include a companion page for my husband. Phil was more than cooperative! Notice how each item on both lists begins with the same word. Wouldn't this make a fun family project? Scrap Your Stash: The April Challenge is to Bring In the Sun. It can be a layout, card, album - anything you want to create that has something to do with the sun. I've got a layout that I'm excited to share with you later this month. It will be posted on both the Scrap Your Stash blog and here on my own little blog. Scrapbookers Anonymous: The April Challenge is to use your eyelet stash! Remember eyelets? Confession: I have no eyelets in my stash. I used them briefly, realized they were just not for me and got rid of them with no regrets, until now. But the kind ladies at SA have excused me for this month. So even if you're like me, still take a peek at this challenge blog. There is going to be a Blog Hop on April 7 and a Design Team Call! Item #2 I've had the honor of receiving another Blog Award! Many thanks to Stephanie, Jade and Michele for this one! The rules are: choose 15 fellow bloggers and share 7 things about yourself. For the 15 bloggers, I kindly refer you to my sidebar of Blogs I Follow. Every one of these crafters is deserving of your attention! And for the 7 things, I kindly refer you to the Most Likely To layout above! Item #3 Today is the official start of my Spring Break! I am so ready. This little vacation time will also include a break from my computer. Happy Spring - see you later in April! And toasted cheese and strawberry? Interesting! I love the idea of the companion pages. These layouts are super cute! Love them! Great layouts! I love the idea of recording these types of things. Have a wonderful spring break! I love that prompt for a layout idea. I might have to try it. Your layouts are fabulous! Thanks for sharing your Most likely to's. They were fun to read. Great idea to do a companion page for your husband. Hope your April is wonderful! Love the idea of making a companion LO for your husband! These layouts are great! I'm going to have to give this a try. Your DH is so accomodating! My DH will do this if asked but his responses will likely be very sarcastic. But who knows, maybe he'll surprise me! Great layouts Sue. I really like that you made a companion page for Phil. I have a layout on my craft table right now and had eight eyelets picked out to use on it (simply because I happen to be re-organizing eyelets and decided to use them), so I'll have to submit it for the Scrapbookers Anonymous challenge this month! Love both of these--cute design and a great concept for a layout! Love, love what you did here. Maybe I will copy your idea, simple and meaningful. Enjoyed reading both lists. Sure fun layouts... loved reading both of your answers! Love your husband's #8. We feel his pain. Great layout...I love that your DH did his too! First, you are so right about April...especially this year! Second, those layouts are just great -- I really love the overall design, especially the focus is on the journaling. Third, you got your dh to journal! That is awesome! Happy weekend, and have a great "spring break"! Hi Sue. Happy Spring.. right??? it's feeling a little more like it each day. I really love your duo layout. very clever idea and so nice of the hubby. Hi Sue, finally a chance to say thanks for your comments and for following my blog. 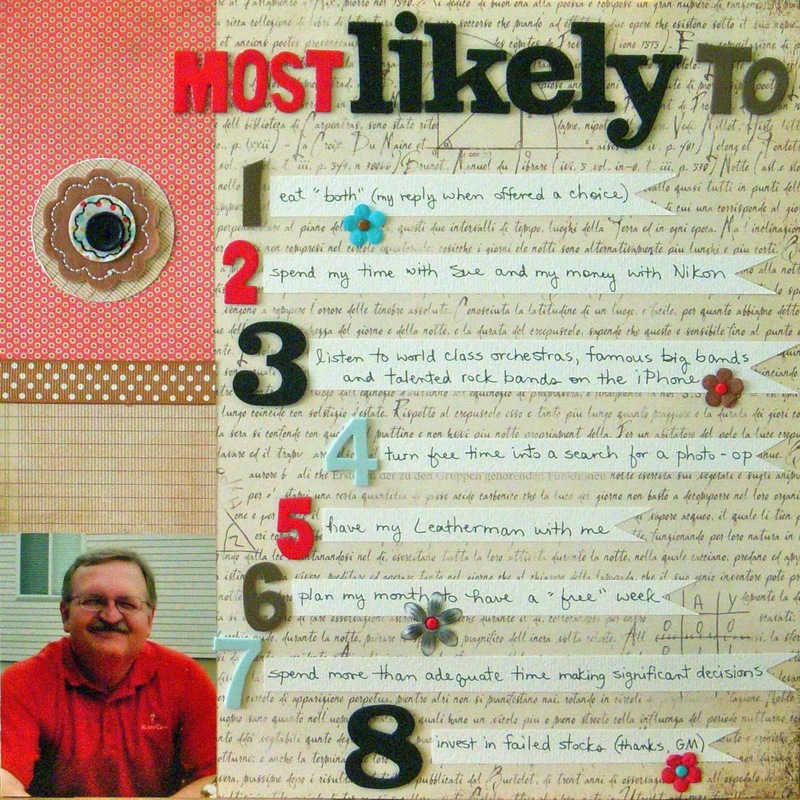 I love the idea of this layout and may just have to scraplift it myself. 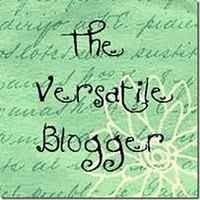 Really enjoying your blog, you deserve the "Versatile Blogger" award as you blog about so many different and interesting things. Oh I feel a scraplift coming on :) Love your layouts, and so wonderful to have one of hubby!